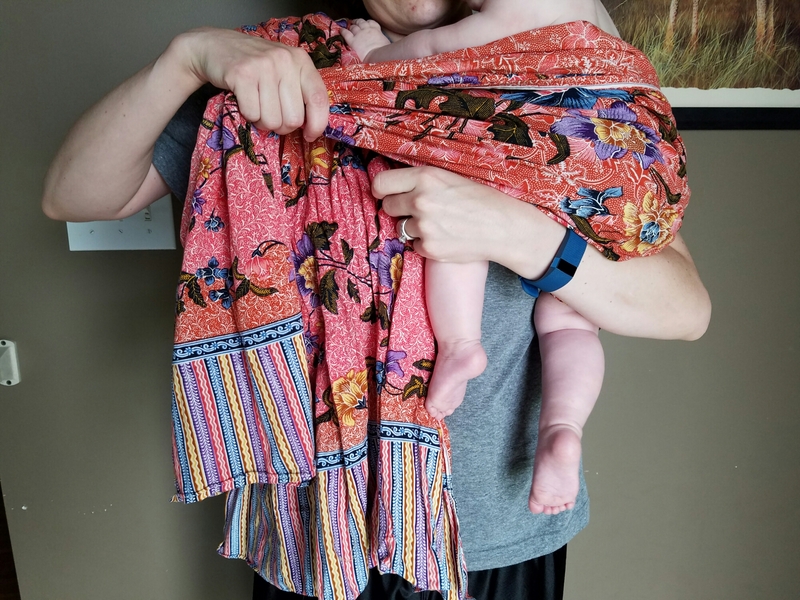 Alright, here we are with our final babywearing post. We talked about the history of babywearing in part 1, the benefits of babywearing in part 2, a few of the different styles of baby carriers in part 3. 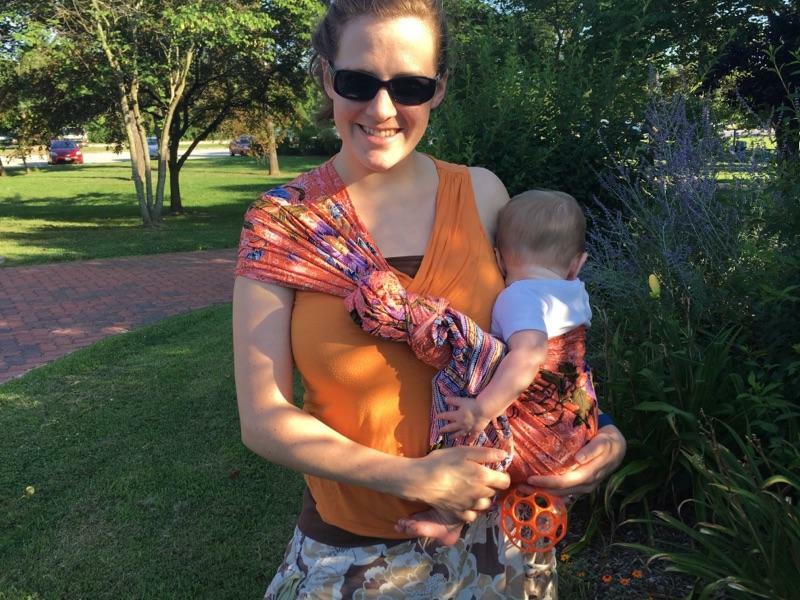 Now I am going to show you my international wraps that you can make yourself as probably the most cost- effective way to wear your child. About 4 years ago, my husband and I went on a missions trip to Zambia, Africa. We absolutely fell in love! In Zambia, the women wear a sort of wrap-around skirt called a chitange (pronounced shi-tang-uh). These skirts also double as their babywearing attire. Life is hard there. Zambia is one of the poorest nations on earth. The men are lazy, and the women have to work very hard all day to provide for their families as best they can. In order to do that, they need their hands free, so they use a chitange to tie their babies on their backs. They can then easily rotate them to the front for nursing (which they do for an extended time by American standards because they don’t have the means of giving their children nutrients otherwise). Not only do the mothers wear babies like this, the older siblings start carrying and caring for the babies from a very young age. As you can see from this picture I took while we were there, this little boy is maybe 6 or 7 and carrying his little sibling down the road on his back. I have a few chitanges in different prints. I have only worn them a few times as I haven’t quite mastered then yet, but I really want to start wearing them more. A friend from Zambia is visiting this summer and bringing another for me, so I’m looking forward to her refreshing me on how to tie them securely. I will repost about them after her visit. The other international wrap I have is from Indonesia. While I have not been there myself, a friend visited last year and brought this back for me as a baby shower gift. At first I was a little leary of it… it’s just a piece of fabric. I didn’t even know how to use it. But thank the Lord for YouTube! 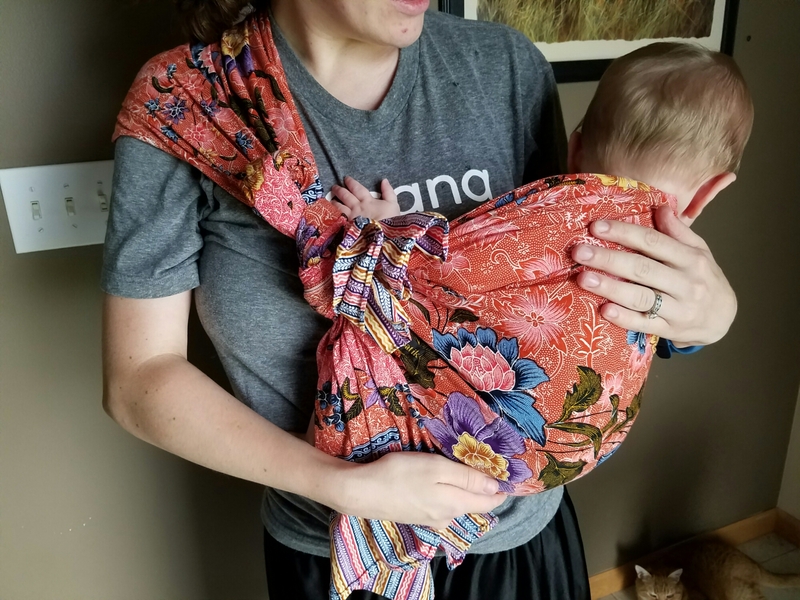 LOL I’m not sure of the technical name for this wrap, but I searched for Indonesian baby carrier and came up with a few different tying techniques. A lot of them didn’t even tie it at all… they just twisted it together. I did not feel comfortable with that, so I kept searching until I came across a tutorial that actually tied it on. I’ve played around with it to figure out the most comfortable height and position to tie it in, and my baby and I both love it! Unlike the stretchy wrap, he can look around and see what’s going on, which he loves! It was also cooler when we spent so much time out in the super hot, humid evenings. And while it only hangs on one shoulder, if tied properly, it’s incredibly comfortable! I wore mine every single day last week during a missions trip, and my shoulder never hurt. My back was getting a little tired of carrying him around by the end of the week, but that’s to be expected when you are carrying a 16-pound baby for 12+ hours a day. 😊 Really, it wasn’t bad though, just a little achy. Anyway, from what I understand after talking to my friend about it, the Indonesian women wear these several different ways (on their backs, on their hips, to nurse, etc. ), so there are more possibilities out there, but I really enjoy the hip hold. 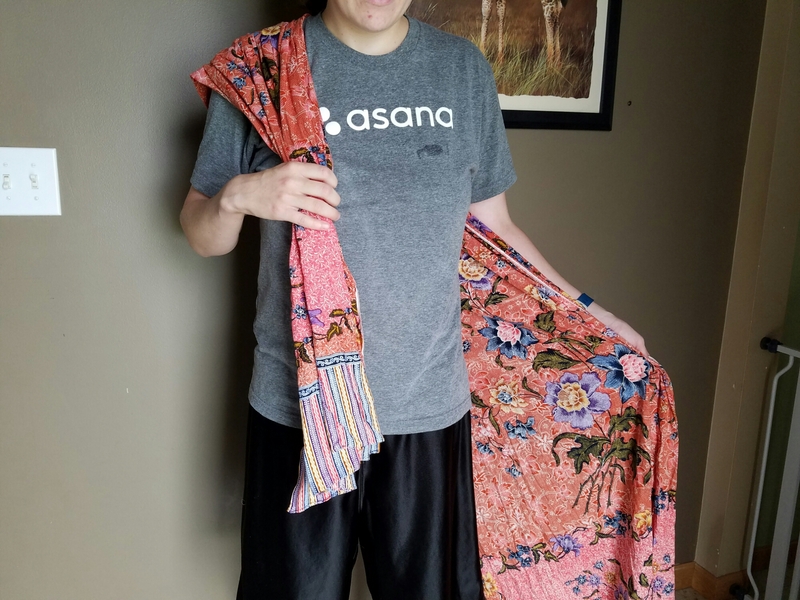 It’s simple: purchase a length of cotton fabric about 2.5 yards (I might actually go up to 2.75 yards, but you can adjust the length based on your body size of you need it longer or shorter. Mine is also about 32″ wide, so if you want less bulk you can cut down your width a bit since fabric usually comes in wider bolts). Hem or Fray Check the cut edge. Your done! So if you consider sales and coupons, you could probably make this wrap for less than $5! Update: Although many countries use whatever fabric is available to them, I have recently found some helpful information on chosing the best/safest fabrics for carriers, as well as tutorials for several different kinds of carriers. If you are interested in making your own carrier, check out the DIY Facebook Group. You can definitely use this one with smaller babies and put them in more of a hammock/cradle hold. 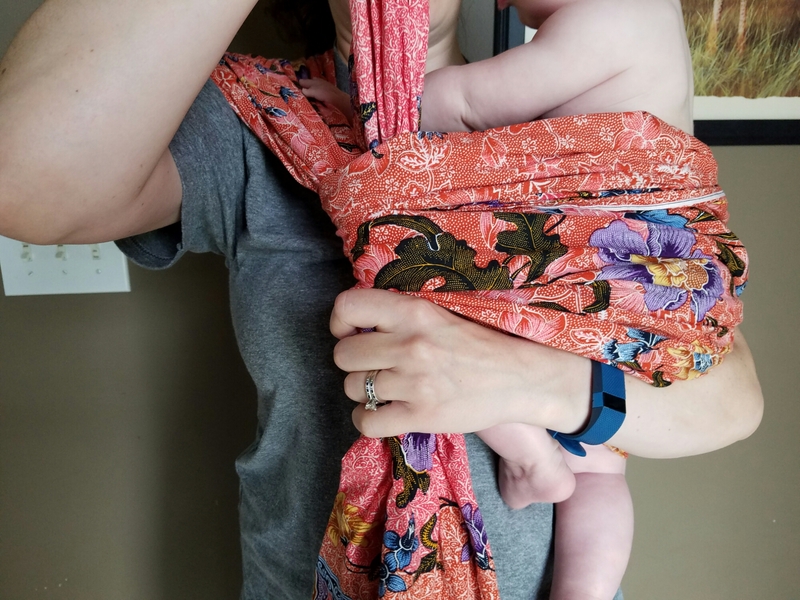 However, I didn’t start using this carrier until Logan was a little bit older and had some head control, so I’m just going to show you the hold I like to use. If you would like to see an infant hold, leave me a comment and I will try to get a tutorial for you. 1. 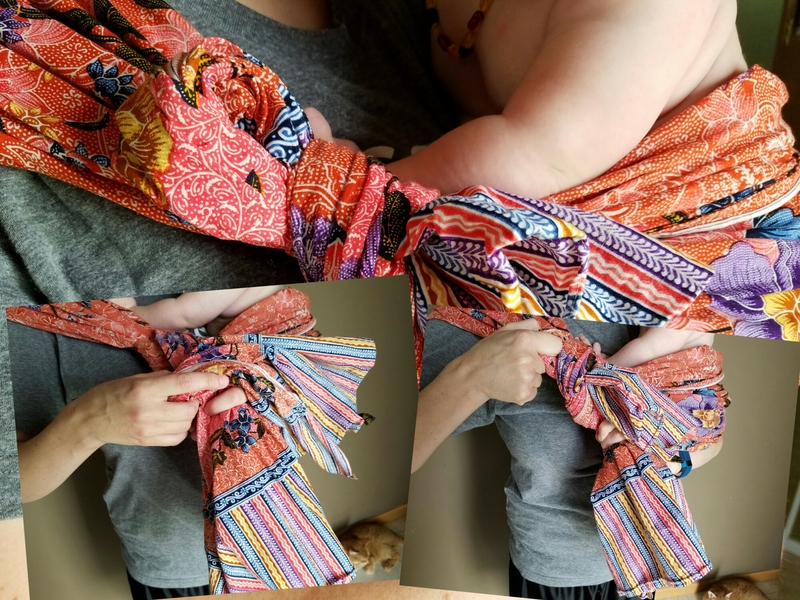 Drape one end over your shoulder to about your hip (you can adjust as needed once you figure out what’s best for your height, baby size, etc). I like to gather it loosely and position further out on my shoulder. This is more comfortable to me. You can spread it out more past the bend of your shoulder, which is even more comfortable, but you won’t be able to raise your arm much. 2. Hold baby fairly high on your shoulder as you bring the other end around him. Make sure it tucks under his bottom up to the bend of his knee, and pull it so it is snug from top to bottom. 3. Cross the second end around the hanging end as you would tie an X in your shoelaces. Pull it fairly snug, but not too tight…this positioning will affect your final sling height (don’t worry, once you settle the baby in, it will be father down than it is now). 4. Wrap the other end around the one you just finished and pull a loop through (don’t pull the whole tail through) until the knot is tight. 5. Settle baby down into the sling, making sure it is tucked well under his bottom into the bend of his knees, and the top is pulled up on his back. You can tuck his back arm into the sling if you need to (I find it a bit more comfortable). 6. To remove, simple hold your baby snugly and pull on the tail of the loop. Tada! So there you have it! You may need to practice a few times to get it comfortable, but it’s really very simple and so much faster and easier than a stretchy wrap. And the baby is able to see the world and interact with it, which is great mental simulation. Enjoy! Do you have a favorite wrap that you love to use? Please share on the comments.